DAN MACLELLAND wins GOLD for CANADA! 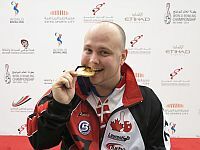 In the championship singles match Dan MacLelland of CANADA bowled local hero Shaker Al Hassan of the UAE in front of a packed crowd at the Zayed Sports City’s Khalifa International Bowling Center. Dan closed with nine consecutive strikes to win the match 256-212. RAISING THE BAR and making us PROUD! This is Canada’s sixth gold medal in World Championships competitions. Each event includes six games of qualifying before the field is narrowed to the top four for the semifinals. All competition is being webcast live on BOWL.com’s BowlTV. For a complete schedule in Eastern time, visit BOWL.com/LiveStream.